So often, creative minds get inspiration that has to “get out” in a matter of speaking. After a recent visit to Southern California in the Laguna Beach area, I felt compelled to paint. 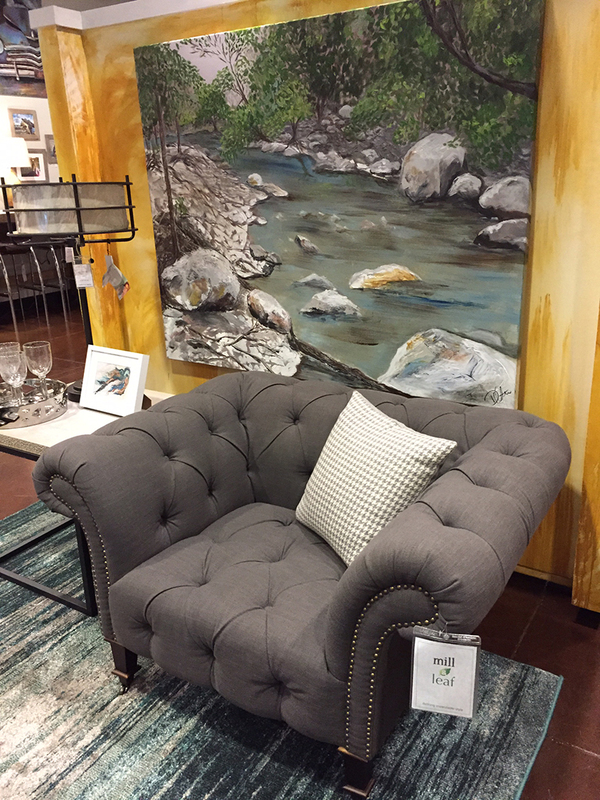 After getting my intense impression of this powerful water down on canvas, I had to share this combination video. It directly parallels what inspired me with the resulting piece. Artists and art collectors often ask themselves or the creative individual “what inspired you?” The truth is, often times, we cannot really put that into words. That’s when the paint brush, composition pencil or interpretive dance studio comes into play. Our communication method is our art form. In coming months, I hope to “catch myself” in the act during more of these interpretive moments. Video is a helpful tool to capture what I am seeing, but the story line is what happens after that inspiration. To anyone viewing or hearing any fresh art piece, interpretive dance or music composition, let us “tell it like it is” in our mind. Looking at things through the lens of interpretation is often organic and exciting. Hence the world of art! 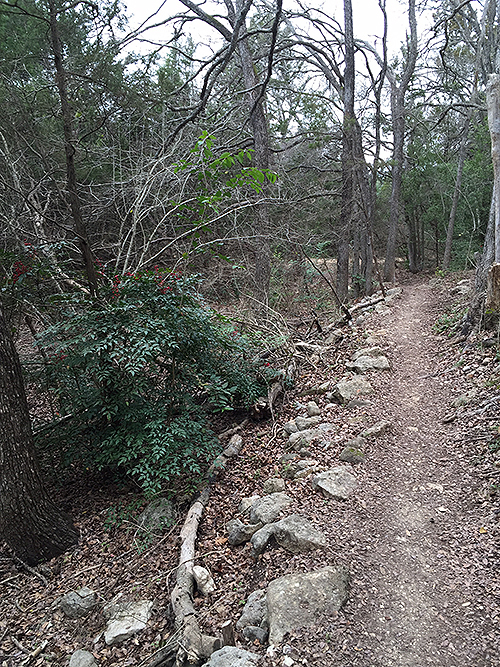 Hiking west Austin has been my hobby for while now. The artistic craggy rocks and tree roots often grow above the ground looking for any rock crack to seep in and look for moisture. As an artist, this added “texture” is incredible. Take a walk with me…. Great Hills Park Feb 15th, 2015. The trail is dry and dusty. Turning a corner on the trail, we see the water source in the park. 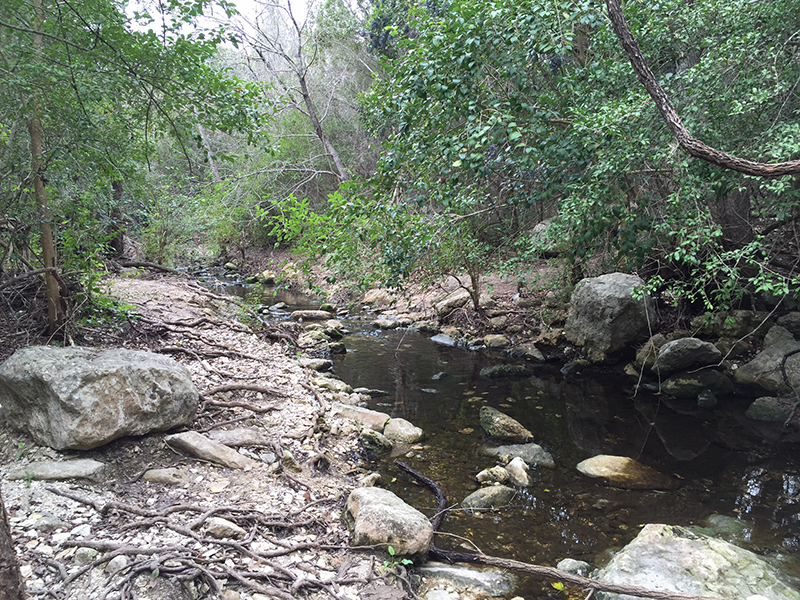 The winter moisture has the creek hardly moving hoping to wake the plants near her edge. The water is clear and grey is the dominant color, though permeated by hopeful green. It is a peaceful setting. Hardly anyone on the trail. A great time to reflect on the winter and look forward to spring. A couple months later, May 2015, I am standing in my painting studio looking at a large 5ft wide by 4 ft tall blank canvas. This painting has to be incredible in order to carry off such a large format. I browse through my photos saved to inspire. I happen across the Great Hills Park trail shots and the creek shot. This is it! From an artist standpoint, I look at the photo in a whole new light. How will I interpret it? I don’t want to create a copy of the image, rather a painting that reflects how I saw the scene as pure poetry at the end of a grey winter. Paint the hope that will bourgeon into a romantic spring. I see pinks and mossy green beneath all the grey. 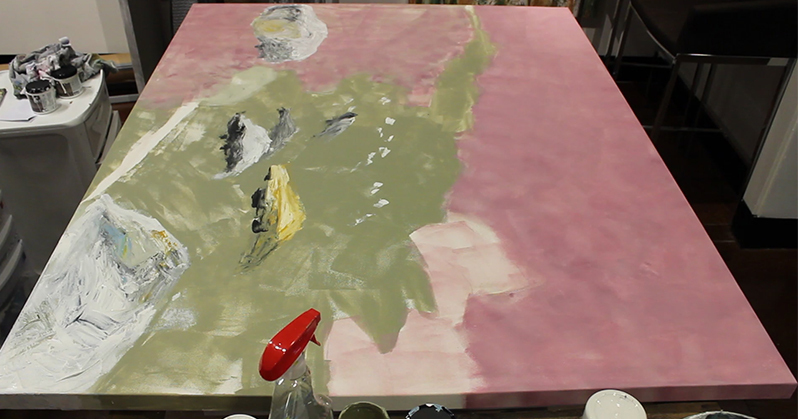 After misting the canvas with water, my background roller is moving fast. I can envision some of the end result, which is hours away, and I want to get there…. A storybook scene in the making. 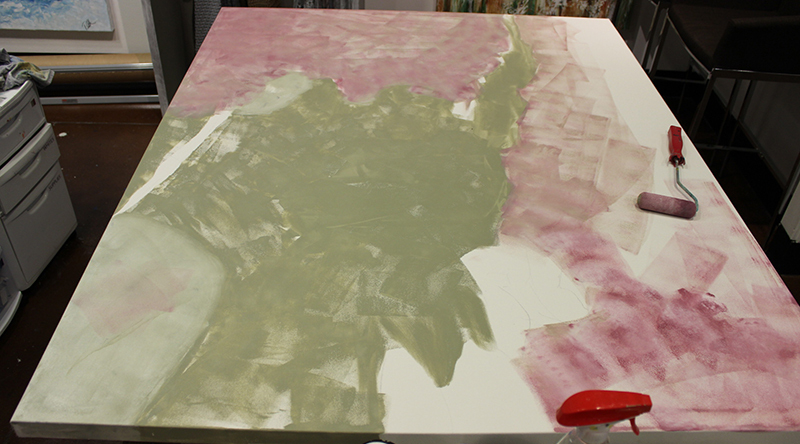 As I paint, I switch to a palette knife for heavy scratch and thicker paint. Mixing heavy matte gel into my paint allows rocks to build up, like the years of compression it took to make the actual boulders – just in minutes instead of centuries. The branch “fell” in the foreground. 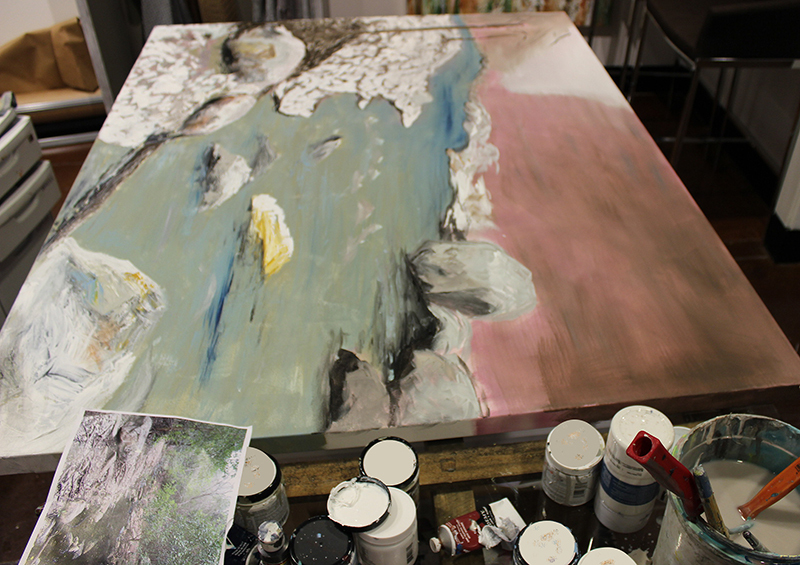 Rather than keeping the nearly black water, I balance the pink undertone layer with a soft blue grey and start to fill in the rocky ground cover with a large brush and palette knife. By the end of three hours, a few branches and tree leaves have been added. This is a great place to stop on day 1 so the next top layers don’t get murky. The next day was a series of working sections with more vegetation and variation. The far bank needed a lot of work over the grey shadow layer. 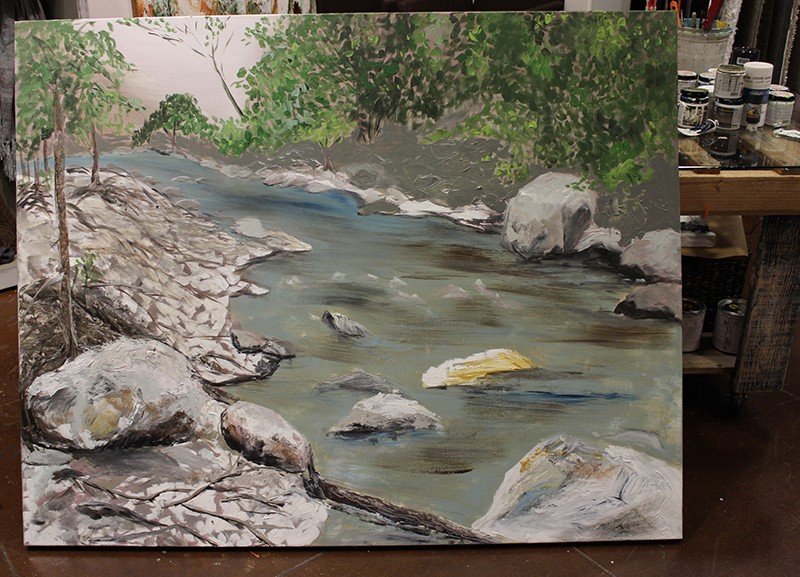 Rocks were painted with flat brushes. Darker colored shapes topped with lighter shades gave them dimension. Roughly 4 more hours of working, stepping back and “growing” my vision for the poetic version of this February day. 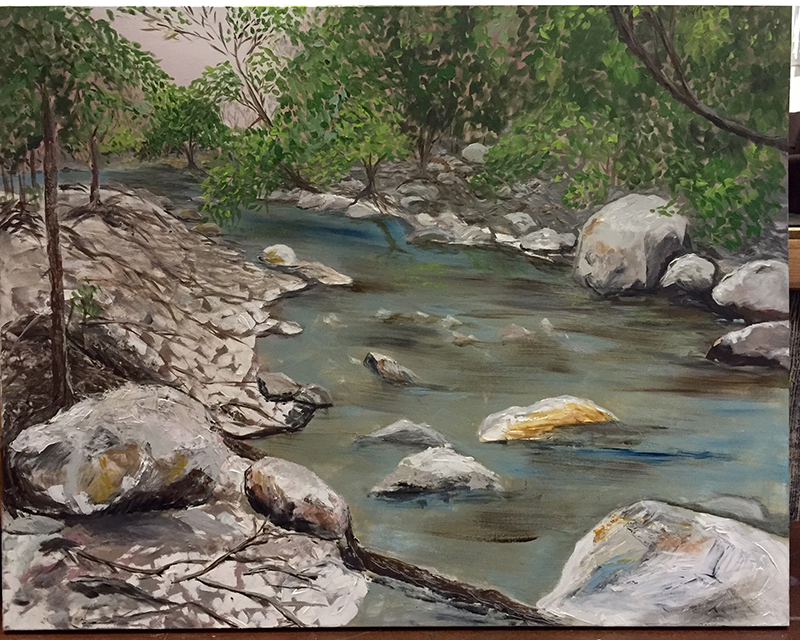 With a few watery details creating shadows and glassy reflections, the painting takes on the feel of a watercolor, even through acrylic paints and mediums were the only products used. Blacker shades like raw umber start to showcase the darkest details. A branch is added in the top right corner and it is 99% done.